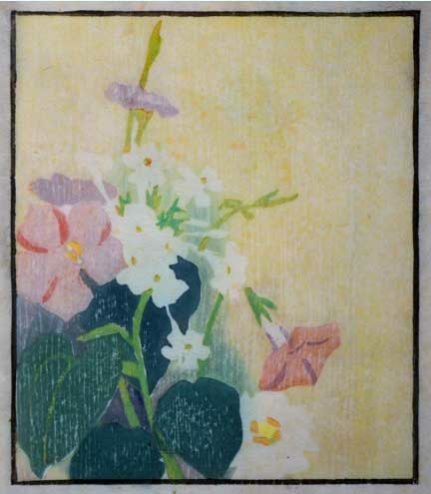 Edna Boies Hopkins, a painter known for her Japanese-influenced floral color woodcuts, was born in 1872 in Hudson, Michigan of a well-to-do family. In 1895, she attended the Art Academy of Cincinnati; and in 1899, Pratt Institute in Brooklyn, New York, studying with Arthur Wesley Dow the technique of Japanese color woodblocks. In 1904 she married James R. Hopkins and their year-long honeymoon was spent traveling the world. Summers were spent in Provincetown, MA and Maine teaching and creating woodcuts.